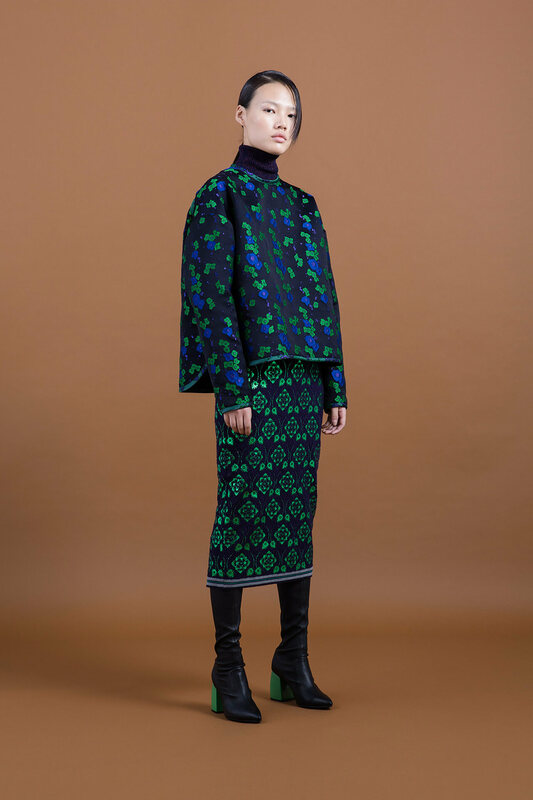 This collection is a sequel to the last season which was the fusion of Russian avant-garde and Japonism. This season, it focuses on Japonism and mixes with luxury street style. The key colors are purple and green that the designer chooses as color of Japan. 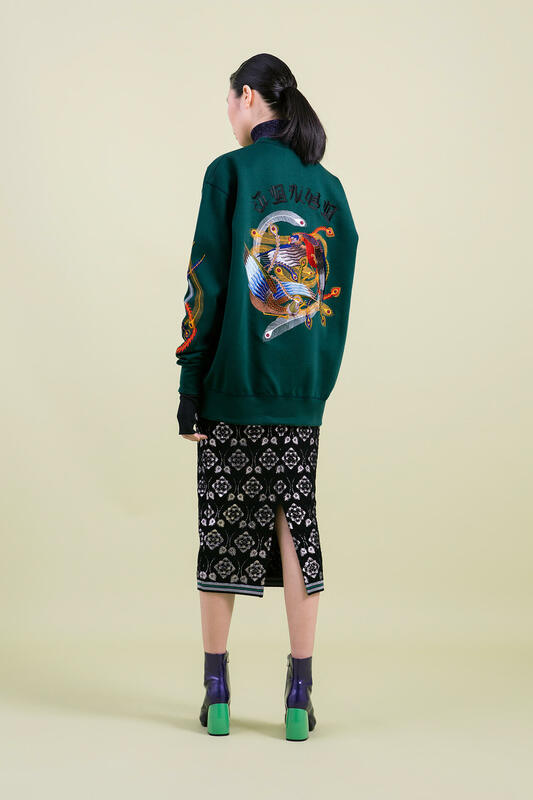 The silk satin souvenir jacket with beautiful phoenix embroidery is the key item of this season. The graphic of JAPAN and TOKYO designed in kanji-like alphabets. 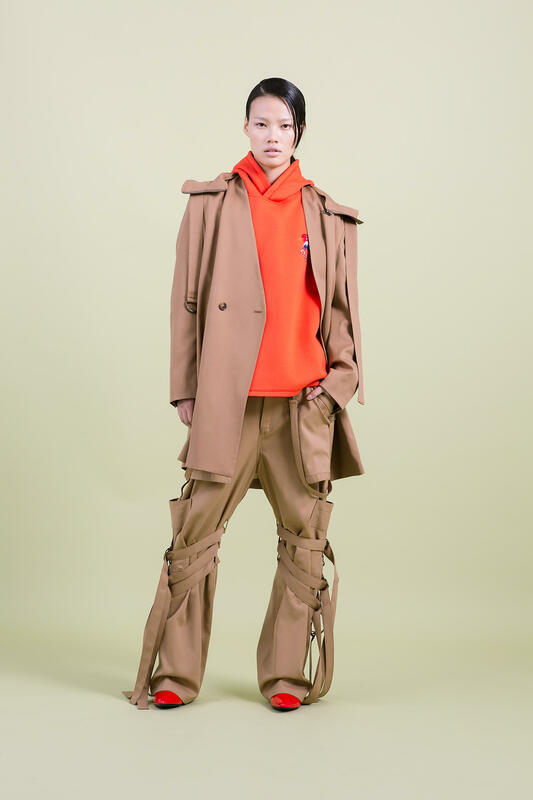 The wide, oversized and long-and-lean silhouettes are inspired by Japanese traditional style such as kimono and hakama pants and obi belt. 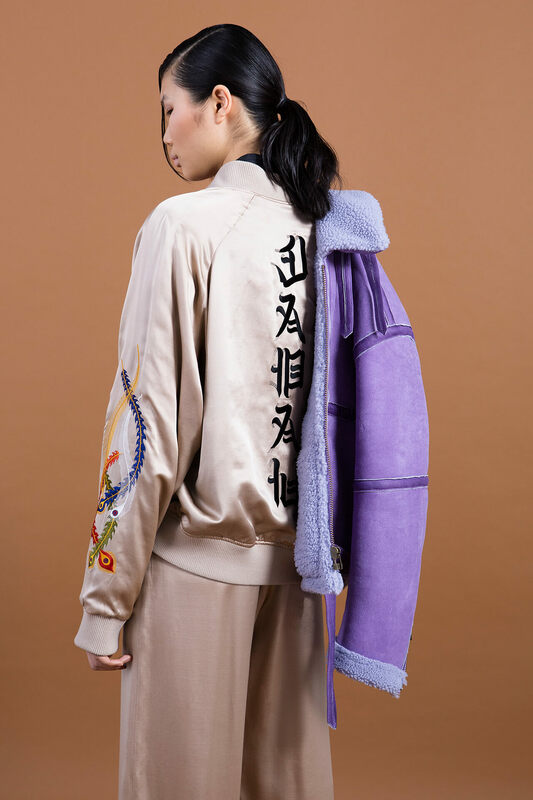 Also Japanese subculture such as yanki* and sukeban* influences the collection. G.V.G.V.’s signature lace up MA-1 jacket is updated in new colors and materials. The lace-up detail can be seen in other items like pencil skirt and biker jacket. Yankii… a subculture that was popular in Japan in the 80's and 90's. It is basically the style of delinquent boys and girls. Souvenir jacket is typical item for yanki. Sukeban…a part of yanki culture. It refers to the leader of a girl gang. They wear altered school uniforms such as maxi pleated skirt and cropped sailor top. Choosing paisley prints from their 2016autumn/winter ‘Susa’ collection which is inspired by Silk Road. The color is exclusive for the G.V.G.V.’s collection. ‘Susa’… The coastal route was indispensable for trade and cultural exchange. The paisley symbol was created in cultural harmony. The pattern is mysterious and designed the paisley looks like drifting in the sea. Japanese legwear brand aiming to adorn every woman’s legs. Collaborating on the legwear lineups for G.V.G.V. 2016autumn/winter collection.